Silver Plated Thali (Size: 5-6 inch) with Soan Papdi 400 Grms. (Gross Weight) from Haldiram. 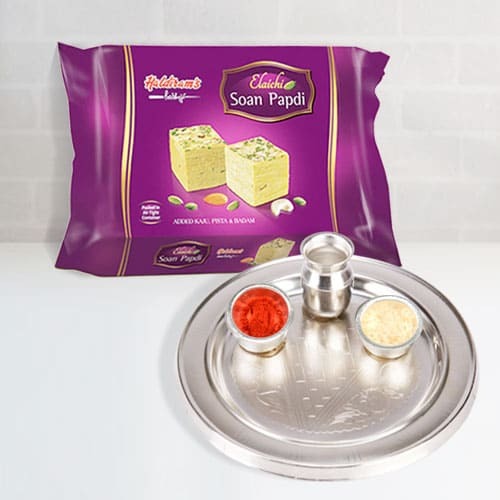 Silver Plated Thali (Size: 5-6 inch) with Soan Papdi 800 Grms. (Gross Weight) from Haldiram. Flowers Delivery Dhanbad, Send sweets Cuttak, Wedding Cake Haridwar, Diwali Mithai Pondichery, Send Flowers and Gifts to Valsad, Online Shop Nakoda, Flower to Thrissur, New Year Flowers Sonipat , Fresh Fruits Bharatpur, Send Gift Shillong, Dry Fruits to Madanpalli, Birthday Delivery Bikaner, Sending to Karauli, Flower shop Trichy, Shimoga Online Cake Delivery.